(2014/Wienerworld) CD: 19 tracks, DVD: 15 tracks. VD: Region Code: 0; Duration: 60 min. 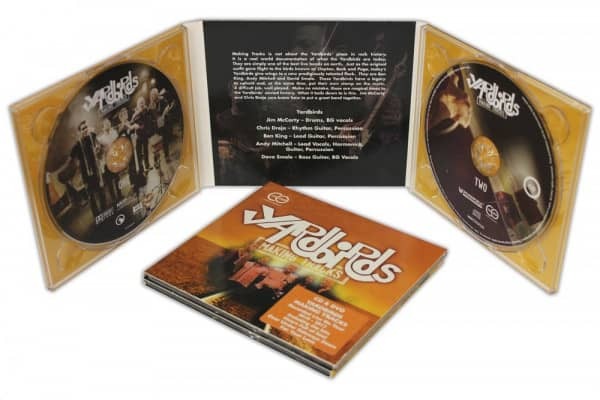 Deluxe digipack. The live versions of 19 songs on Making Tracks from different tours in 2010 and 2011 and are here for the first time available on CD (with the exception of "Heart Full of Soul," "Mystery of Being" and "For Your Love"). Tinker Tailor Soldier Sailor was never before sung by one of the Yardbirds formations. With full-color booklet, a short biography, band line-up and photos. Line-up: the original members include Jim McCarty (drums) and Chris Dreja (rhythm guitar). Lead guitarist Ben King joined the band in 2005, singer Andy Mitchell and bassman Dave Smale in 2009. The Yardbirds have had a number of hits in the mid-1960s, including For Your Love, Over Under Sideways Down and Heart Full of Soul - you can find them on this album. The Yardbirds broke up in the late 1960s and turned almost immediately into the legendary Led Zeppelin. In 1995 there was the reunion of the Yardbirds, from which emerged the careers of Eric Clapton, Jeff Beck and Jimmy Page. Customer evaluation for "Making Tracks (CD+DVD)"